“Here we find not across upon which the storms of hundreds of Dartmoor winters have left their mark but one of quite recent erection.”, Crossing, 1902. 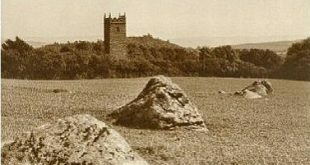 Prior to Queen Victoria’s Diamond Jubilee of 1897 a committee of the Dartmoor Forest dwellers decided that to mark the event a cross was to be erected on the small common at Hexworthy. It was agreed that the cross should be made of local granite which was sourced from the quarries of messrs Duke at nearby Merrivale. The cross was to stand upon a three tiered pedestal around which was inscribed on the top tier; “To the glory of god – in commemoration of the – 60 years of – Queen Victoria’s reign.” The cross shaft then bore the inscription; “V R – a crown symbol – 1837 – 1897.” The cross head was a Maltese cross inside a Celtic wheel design which as it transpires is the only example of such on Dartmoor, excluding graveyards. The height of the cross was 2.32 metres with a circumference of 1.00 metre at its widest point, Sandles, p.46. The unveiling ceremony took place in 1897 which apparently was well attended by a “goodly number of people” and included a dedication service. “An interesting incident occurred at Hexworthy a few days ago. Through the interest of Mr. S. P. Adams, a handsome cross was erected to commemorate the Diamond Jubilee. Many people went over from Princetown to witness the unveiling by the Rev. W. A. Badger, rector of Lydford. The cross is said to be the only one erected to commemorate the sixty years’ reign. A short religious service followed, and in the evening a Harvest Festival was held in Huccaby church, the Rev. W. A. Prideaux, vicar of Leusden preaching.” – October 15th, 1897. As can be seen from the photographs above, things can drastically change over the course of 120 years. What was quite recognisable as a ‘green’ back then has now turned into a scrubland carpeted with bracken. The inscriptions on the cross are barely legible and in serious need of re-cutting. I know funding is a serious problem but maybe when it comes to protecting such legacies as this cross there are some current causes from which monies could be diverted. A recent and fitting addition to Hexworthy Green is the commemorative 2012 Jubilee Stone which was added in recognition of Queen Elizabeth’s diamond jubilee. As can be seen above it is a dressed diamond(ish) shaped granite block with chamfered edges which carries the inscription; “TO COMMEMORATE THE DIAMOND – JUBILEE OF QUEEN ELIZABETH II – JUNE 2012.” Considering there are now two diamond jubilee memorials on the green maybe it should be called the ‘Diamond Jubilee Green‘.